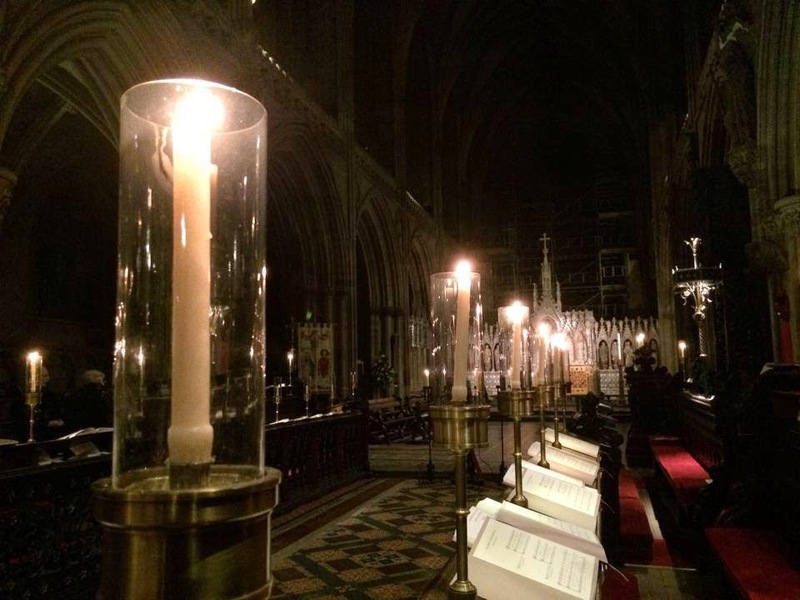 I first heard ‘The Song of the Tree of Life’ on Begone Dull Care (Lammas Records, LAMM 107D), a recording by the choristers of Lichfield Cathedral, directed by Andrew Lumsden, now Organist and Director of Music of Winchester Cathedral Choir, and accompanied on the organ by Robert Sharpe, now Director of Music at York Minister. Of course, Vaughan Williams was a direct descendant, through his mother, of Erasmus Darwin (1731-1802), who lived in the Cathedral Close in Lichfield. This recording by the choristers of Lichfield Cathedral was made in June 1998 in Hawkesyard Priory, Armitage, near Rugeley and six miles north-west of Lichfield. 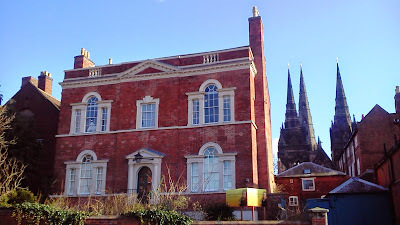 This is one of the architectural gems of Staffordshire and was built in the late 19th century by Josiah Spode IV (1823-1893), who was also a keen organist. Spode House later became a Dominican Priory, and the church was built between 1896 and 1914 for the Dominicans by the architect Edward Goldie. I knew the place well in my late teens and early 20s, when the Folk Masses in the priory chapel were popular with many of my friends from Rugeley, Brereton and Lichfield. It was the early 1970s, and at that age I enjoyed the music of English folk rock bands such as Steeleye Span, Pentangle, Fairport Convention, Lindsifarne and Jethro Thull. Their music provided an interesting bridge to both the music of Vaughan Williams, which I was introduced to in rural Shropshire, and the Folk Masses at Spode House, which had become a popular venue in rural Staffordshire for retreats, short courses on church music, theatrical groups, youth organisations, prayer and reflection. The friars included Father Donald Proudman, who had died before I ever got to know the place; the saintly and philosophical Father Columba Ryan (1916-2009), who was immersed in the history of the house, who was a CND supporter until his dying days, and whose father was the last British dragoman in Constantinople; and Father Conrad Pepler (1908-1993), the founding warden, who we did not know had provided a Roman Catholic funeral in Cambridge for the philosopher Ludwig Wittgenstein. The monastery and the conference centre closed when the last Dominicans moved out in 1988. The place became a nursing home and the hall fell into disrepair and was boarded up until 1999, when the hall was bought by the Whorton family who were determined to return the building and the estate to its former glory. The transformation of the Hall and outer buildings was completed in 2007, and the estate includes Hawkesyard Hall, Saint Thomas’s Priory Golf Club, Armitage Park conference and events centre, and the home of the Wolseley National Car Rally. The Priory Church is now used on Sundays by an Old Catholic group. At lengthy lunch in Lichfield a few years ago, some of us recalled so many of our friends who loved going to Hawkesyard for the folk masses and the extended Sunday afternoons that inevitably followed. There were six underground tunnels at Hawkesyard, built to allow the estate workers to move quickly around the area, and we were convinced that two tunnels lead to Lichfield and Armitage. But was I really the one who was so fearless to lead a group of us through those unexplored tunnels and vaults? And are the tunnels still there? This morning’s song by Vaughan Williams, ‘The Song of the Tree of Life,’ is a revised version of one of the songs from his setting of John Bunyan’s The Pilgrim’s Progress as an opera. Yesterday, as I was reflecting on ‘He who would valiant be,’ I mentioned how, from his childhood, Vaughan Williams had been attracted to the sturdy and simple prose of John Bunyan, with its sincerity and spiritual intensity. Vaughan Williams described his Pilgrim’s Progress as a ‘Morality’ rather than an opera, although he intended the work to be performed on stage rather than in a church or cathedral. The opera, which includes 41 individual singing roles, was first performed at the Royal Opera House, Covent Garden, on 26 April 1951, conducted by Leonard Hancock and directed by Nevill Coghill. He prepared the libretto, with interpolations from the Bible and also text from his second wife, Ursula Wood. His changes to the story included altering the name of the central character from Christian to Pilgrim. which is in the midst of the Paradise of God. the Leaves of the Tree are for thy healing. In the midst of that fair City flows the river of Water of Life, clear as crystal. Who so will, let him take of the Water of Life freely. Who so drinketh of this water shall never thirst. Take thou the Leaves of the Tree of Life. So shalt thou enter in through the Gates of the City. In these words, the author of Revelation, Bunyan, and Vaughan Williams link the death on the Cross with the Tree of the Life, the Crucifixion outside Jerusalem with the hope for the New Jerusalem. In The Pilgrim’s Progress, we find a return to the idea of a spiritual journey that also attracted Vaughan Williams to Walt Whitman in A Sea Symphony. His music to Bunyan has a moving restraint, an inner spirituality, a strength and a conviction that show the composer gripped by the text and responding in an inspired and ecstatic fashion. Vaughan Williams is generally said to have been an atheist or an agnostic. But if this song shows where Vaughan Williams placed his hope how he trod the pilgrimage of life, then he shared in the hope for Easter that we should all be sharing in this season of Lent. 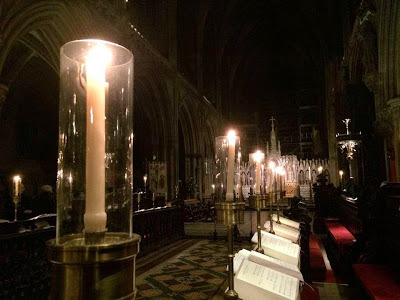 Meanwhile, although Saint Chad’s Day falls on 2 March, today [1 March 2015] is being marked in Lichfield Cathedral as the Patronal Festival of Saint Chad, with the Dean of Lichfield, the Very Revd Adrian Dorber, presiding at the Patronal Eucharist at 10.30, when the guest preacher is the Roman Catholic Archbishop of Birmingham, the Most Revd Bernard Longley.